This provider is not accepting online appointments currently. Call the doctor's office at (832) 380-8291 to book an appointment. Internal Medicine - Kidney diseases - Hypertension - Dialysis. Dr SABER is BOARD CERTIFIED both in NEPHROLOGY and INTERNAL MEDICINE, certified by the American Society of Hypertension ASH as a SPECIALIST in clinical HYPERTENSION. 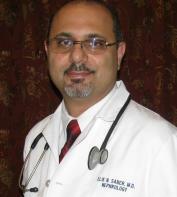 Dr SABER is a Fellow of the American Society of Nephrology, and a Fellow of the American College of physicians. We make it a priority to establish a good patient-physician relationship.We thrive to keep our physicians up-to-date with continued medical education.If you have questions about our practice we are happy to discuss those with you. We will do our best to make your visits to our office stress free and comfortable. Global Nephrology Hypertension Clinic is conveniently located in the heart of the Texas Medical Center. Our Mission is to provide Dedicated Dependable Comprehensive Kidney Disease and Hypertension Management. The Global Nephrology Hypertension Clinic accepts most major insurance plans.